Yesterday, again was a day of moving hearts for me. DNA daily had carried a news on 3-5-09 about the plight of a gifted intellectual child, Bhargavi struggling to continue her education thanks to the menace of poverty. Her father who is an auto driver struggles to earn as little as Rs. 4000, a month will have to take care of a family of four. This child has fought poverty to score 97.74 % marks in her SSLC exams and was on the verge of discontinuing her studies till a report by Ms Rashmi of DNA moved many hearts including mine. 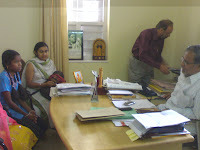 Her parents along with Bhargavi and the reporter Ms Rashmi visited my House yesterday on my request. I could see the glitter in the eyes of the child when she was confidently describing, she wanted to pursue research as her career. It was her dream to learn in MES college. I promised to extend her all my support in making her dream a reality. Looking at her conviction, my determination to help her has bolstered by a notch. I am at it! This is one of many such incidents how media can influence the society positively! My sincere admirations go with all those fellowmen who have come forward to help this child! When they were leaving my office, a quote by the great Henry David Thoreau drifted through my mind - "This life is not for complaint, but for satisfaction" . Indeed, my day was made !